When initially naming the new Plant File, you selected a MAIN category for the plant. Under the Plant Type tab in the Plant File Editor, you can select other Plant Type categories that apply to a specific plant. To begin, click on the Plant Type tab in the Plant File Editor. Next, click on any Plant Types that apply to the plant you are working on. 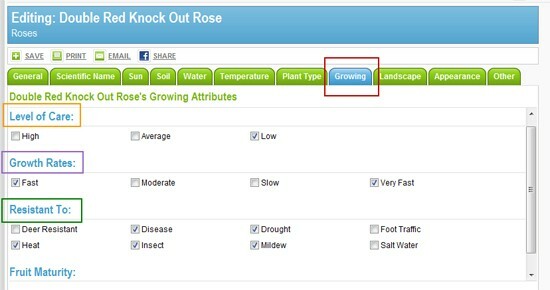 Under the Growing tab in the Plant File Editor, you can select and provide information about the Level of Care, Growth Rates, Resistances, and Fruit Maturity of a specific plant. To begin, click on the Growing tab in the Plant File Editor as shown boxed in red in the image to right. Growth Rates - This refers to how fast or slow a particular plant grows. Select from Very Fast, Fast, Moderate or Slow. You can make multiple selections. Fruit Maturity - This refers to the amount of time it takes for a fruit bearing plant or tree to produce fruit after it has flowered. NOTE: During the process of making selections, you can "Undo" any selection you've made by clicking on the "Undo" link next to any particular selection in the Your Changes section as seen in the image below.